There are films that are hard to watch because they are so bad. And then there are films that are hard to watch because they are so good. Prisoners definitely falls into this latter category. For people with children, this may very well be the most torturous two and half hours they’ve had in a long time. Then again, they have children…so perhaps this film pales in comparison. But, living with the idea that your children may be arbitrarily taken, and then turning inside yourself to examine just what you would do to get them back, may be an exercise that you don’t want to go through. And believe me, the truth that sits deep in this film may be more than many want to face. Because this is a crime drama with lots of twists and tension, I’m not going to dive too deeply. The script is surprising coming from Contraband scribe Aaron Guzikowski, but with multi-Award winner Denis Villenueve ( Incendies (2010)) at the helm of Guzikowski’s story, an amazing film arises with plenty of shades of grey to make you think. Villenueve guides us through a maze of plot points, decisions and people, leading us into dead ends, or turns where some question the direction and others are certain they are going the right way. 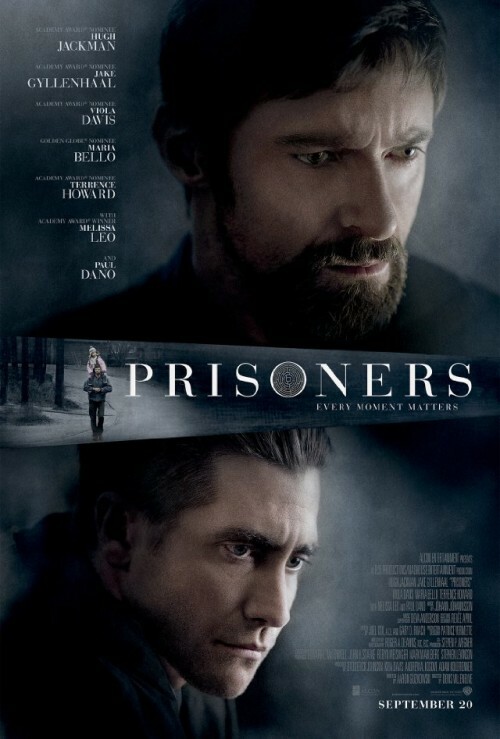 The whole cast is strong with Hugh Jackman leading the anger of the situation, Maria Bello representing apathetic impotence in the situation, while Terrence Howard and Viola Davis tread a fine line trying to make sense of things. All of them, prisoners of the situation they’ve been forced into. Even Jake Gyllenhaal as the detective is a prisoner, held captive by a previously flawless record, an incapable chief, and decisions between what’s right and what’s legal. I will be surprised if some Oscar nominees don’t come out of this, including photography by Roger Deakins of many Coen brothers films like O Brother Where Art Thou? and No Country For Old Men as well as The Shawshank Redemption. Hopefully after being nominated 10 times, this might be a winner. Deakins’ eye is impeccable as is his feel for what kinds of shots contribute to the story. He isn’t afraid to let the dark fall into black to put us into the state of the character, which frequently isn’t a place we want to be. He also allows the scenery to take over the scene where characters remain faceless to represent a whole, or when others are making decisions that change them into someone unrecognizable. The choice of going with a 1.85 aspect ratio is one I am sure is meant to make the events more personal and more immediate. This is not an epic film with sprawling vistas. This is about people, and the more screenspace you fill with those people, then more the audience will relate to them. The tensions starts from the very first shot following a camper through a neighborhood (tense because you saw the trailer), all the way through to the very end frame with a payoff that is setup in the first five minutes of the film. This doesn’t let go, and no matter what is happening on screen, you are always aware of the ticking clock that clicks away the probability that this crime will be solved. Definitely a film to see. And I recommend seeing it in the theater while its still here. Its not a happy film, but it’s troubling and moving — in a good way!